Texas Commission on Environmental Quality (TCEQ) has been reviewing permit process for portable plants and in particular warm mix additives (all suppliers) since these have not been reviewed in detail. Zydex Industires ran tests to assist TCEQ to better understand the emission process involved with these additives. The Rolling Thin Film Oven test is a specified test method in the SHRP grading test. The test is used to duplicate the short term aging of asphalt during the hot mix asphalt manufacturing process (not long term aging). The test is run at 325 degrees F and involves placing 8 bottles with a specific amount of asphalt into a rotating rack in the oven. The rolling action makes a thin film in the oven and exposes the asphalt to air. Two key measurements are made on the asphalt after aging; mass loss (the amount of oils evaporated out of the asphalt) and the change in stiffness of the asphalt (DSR). The higher the DSR the harder the asphalt. For this study 4 bottles of PG 64-22 without ZycoTherm and 4 bottles of the same asphalt with ZycoTherm were placed in the oven at the same time and aged at 325 degrees F. A second test was run the same way except the oven temperature was lowered to 290 degrees F (the common mix temperature used by contractors using ZycoTherm. The test results indicate that at 290 degrees the mass loss (emissions) was reduced by 93%. Another important result was the difference in aged DSR at 325 degrees. 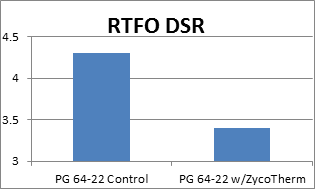 The ZycoTherm treated asphalt had a DSR of 3.4 vs the untreated asphalt DSR of 4.3. These are significant differences and indicate that ZycoTherm provides aging resistance.